AMES, Iowa – Iowa State volleyball (21-13, 9-7 Big 12) lost two sets total in the National Invitational Volleyball Championships. On Tuesday in Hilton Coliseum, Iowa State swept Tulane (29-9, 13-5 American) (25-21, 30-28, 25-16), winning the NIVC. “I’ve never ended the season with a win at Iowa State – I would say it’s a pretty good feeling,” senior Jess Schaben said. Schaben, an outside hitter, capped off her illustrious career winning the NIVC Tournament MVP. Schaben averaged 5.8 kills per set and 3.5 digs per set. She recorded a double-double in every NIVC match. Against Tulane, Schaben recorded a double-double – her fifth of the tournament with 14 kills and 10 digs. It’s not just the numbers with Schaben, though. She wants the ball in critical moments. In the second set, Schaben got the kill to tie the match at 27 by firing an absolute rocket cross court. 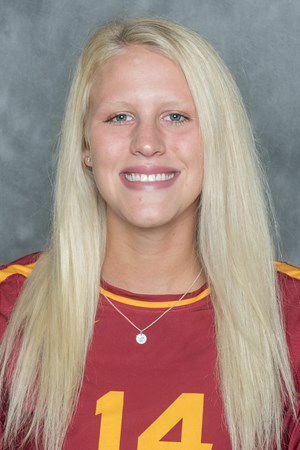 Two service errors – one by each team – and a Jenna Brandt kill later, Schaben, again came through in the clutch for the Cyclones, getting the kill to end the second set and giving the Cyclones a commanding advantage heading into the third set. Schaben’s numbers are great, but it’s her clutch play that separates her. It’s easy to put up numbers in easy situations, but in critical situations Schaben needs the ball. “I haven’t coached a lot of players like her that just love the competition,” Johnson-Lynch said, who coached 12-straight NCAA Tournament teams before this season. “The bigger the point, the bigger team, the bigger the match – she loves that. It’s hard to find players that can embrace that all the time. Iowa State controlled the third set from start to finish after Schaben shut the door on the second set. When Iowa State won, Schaben and fellow senior Hannah Bailey went over to get receive the NIVC Championship trophy for the team. Schaben wrapped the trophy in a big hug with tears running down her face.